Help the penguin family escape from the land of the dinosaurs! 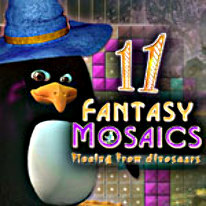 Following in the colorful tradition of the previous Fantasy Mosaics entries, comes this all new installment with an all new gallery of custom built mosaic puzzles! Fleeing from a land filled with fearsome dinosaurs, the penguin family finds themselves lost in an ancient forest! Help them make new discoveries and find a way out by solving complex puzzles!